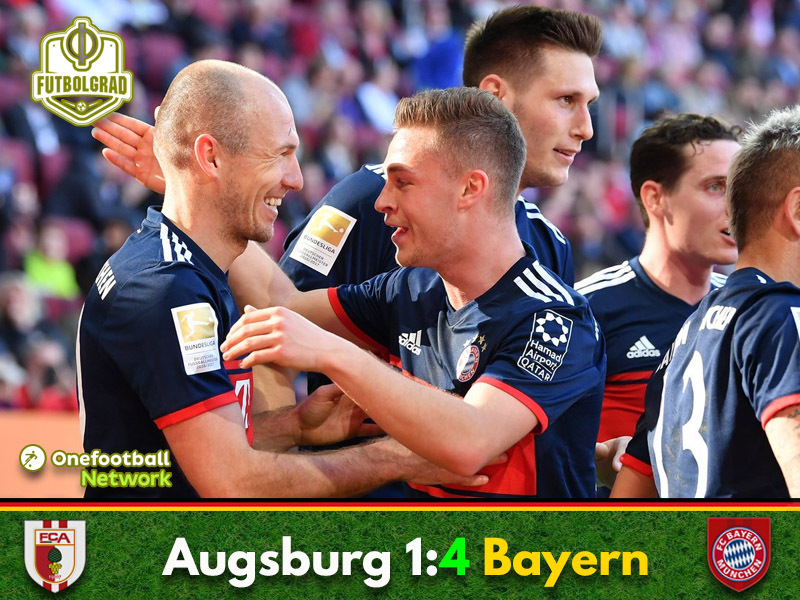 Bayern may have started the match slowly, but in the end, Augsburg vs Bayern ended with the Rekordmeister wrapping up their sixth Bundesliga title in a row. Bayern with a glorious comeback victory to win the title. Kimmich with the man of the match award. Bayern keep dominating the league. Bayern head coach Jupp Heynckes rotated his side with Corentin Tolisso, Sebastian Rudy, Arjen Robben and Sandro Wagner all rotating into the side. Facing a re-shuffled Bayern Augsburg were not afraid to take the game to the Rekordmeister, and in the fifth minute Augsburg’s Caiuby breaking forward on the left-side and his low drive towards the far corner of the goal had Bayern keeper Sven Ulreich beat, but the shot about missed the goal. Bayern seemed unfocused, and in the 16th minute, Augsburg produced the next chance with Daniel Baier playing a perfect pass to Philipp Max, who had anticipated Bayern’s offside trap and his shot from the left corner of the penalty box hit the woodwork. Two minutes later Augsburg were up front. Jérôme Boateng gave the ball away to Sergio Cordova, and the Venezuelan went one-versus-one with Ulreich, who managed to stop a close-range shot, but the rebound hit defender Niklas Süle in the face from where the ball went into the goal. Die Roten seemed rattled. But Bayern are always a dangerous side, and in the 32nd minute, they scored with their first chance. Joshua Kimmich had the room on the right to cross the ball in the box where Tolisso was left free, and the French midfielder had no problem noting the ball home from a close-range. The goal started Bayern’s onslaught and in the 38th Kimmich spotted Rafinha in the box, the Brazilian backheeled the ball to James, who scored from nine-yards out. It was remarkable how Bayern were able to turn the match around in a heartbeat switching into a different gear that made it impossible for Augsburg to keep up. Bayern kept the pressure up on Augsburg at the start of the second half. Slowly but surely tightening the noose on Augsburg Bayern kept possession trying to spot a weakness in the Augsburg backline. In the 62nd Bayern finally executed an attack successfully. A deep ball found James on the byline and the Colombian played the ball back into the box where Arjen Robben found the space to score Bayern’s third goal of the game with a beautiful volley from 12-yards out. Bayern kept up the pressure. In the 73rd minute, a low curled freekick by Robben was stopped by Marvin Hitz, and in the 76th minute, Rudy and Wagner went two-against-one on Augsburg’s goal but Rudy misplayed the ball, and Hitz was there again. The fourth goal finally arrived in the 87th minute with Rudy delivering a perfect corner into the penalty box where Wagner found plenty of space to score his ninth Bundesliga goal of the season. It was the final moment of the game, and three minutes later Bayern München had wrapped up their sixth title in a row with a convincing performance against their local rivals. Joshua Kimmich was the Futbolgrad Network man of the match. The 23-year-old showed leadership qualities when Augsburg had Bayern rattled early on by pushing his side forward delivering the assist that equalised the game and was then also involved in Bayern’s second goal of the game. The right-back was flawless throughout the remainder of the game with a pass accuracy of 95.4%. Bayern wrap up their sixth Bundesliga title in a row and their 28 German championship overall. It is a remarkable feat given how Bayern have started this season under Carlo Ancelotti. Appointed in October Bayern were five points behind leaders Borussia Dortmund at that point. Taking over the club on matchday 8 Bayern only lost twice under Heynckes – to Gladbach and Leipzig – and now wrapped up the title with five games left in the season in what has been a stunning season by the club. Bayern win their 28th championship. Frank Ribéry became the first foreigner to win eight Bundesliga titles. Only five players have scored more Bundesliga goals since Arjen Robben joined the league in August 2009 (95 goals).